Beuvron-en-Auge is one of the 'most beautiful villages of France', situated to the west of Lisieux and 25 kilometres east of Caen, in the Calvados department of Normandy. 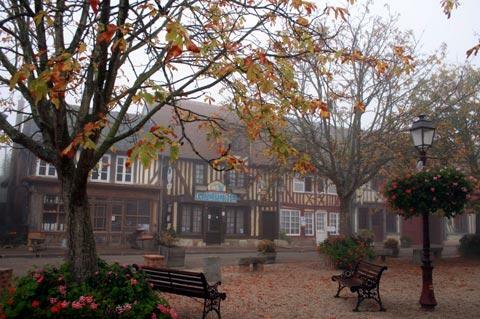 Some 'most beautiful villages' are more beautiful than others and in my opinion Beuvron-en-Auge is one of the best. 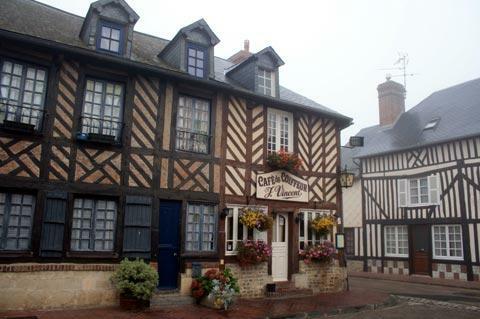 Almost every house in the village is built in the gorgeous half-timbered style for which Normandy is famous and those that aren’t serve as an interesting contrast to highlight the splendour of the others, although many of these are also very attractive buildings. 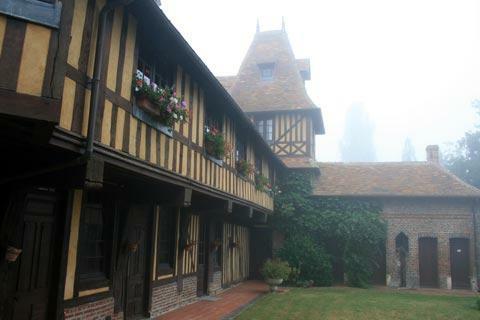 The buildings in Beuvron typically date back to the 17th century and there is a beautiful manor house dating back to the 15th century. 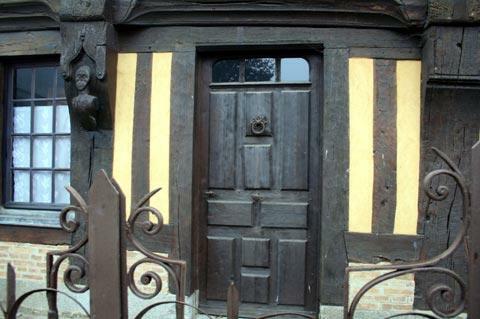 Take a close look at the manor house, classified as a monument historique, as the detail on the woodwork is superb, with faces and patterns carved into it. The village largely lies along one main street but this really is a beautiful street, even more so because almost every pavement edge has been beautifully planted with a mass of rudbeckias, nicotianias, salvias and much more. 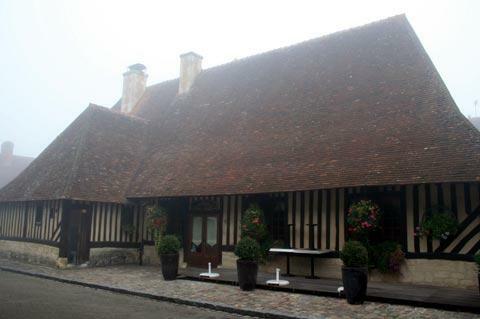 Many of the houses are now shops selling local produce such as cider and calvados, or cafes and restaurants, as well as several antique shops and artist workshops. 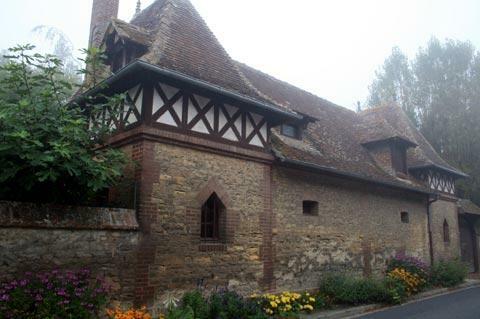 The village Church of Saint Marin is also built in the style typical of the region. The Tourist Office in Beuvron organise guided tours of the village: these are a very good idea because they will highlight buildings and details that you will otherwise not notice. 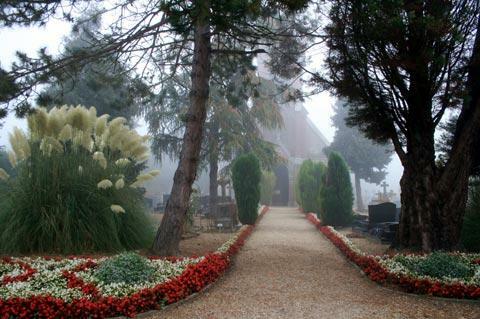 Beuvron-en-Auge has been awarded three flowers in the ‘village fleuri’ competition and it is well deserved. In the centre of the village is a small but very attractive square, also filled with flowers. Each year in the first week of May the town features a flower festival - geraniums a speciality - and a very large cider festival is held at the end of October. Both events are great times to visit the town if possible. 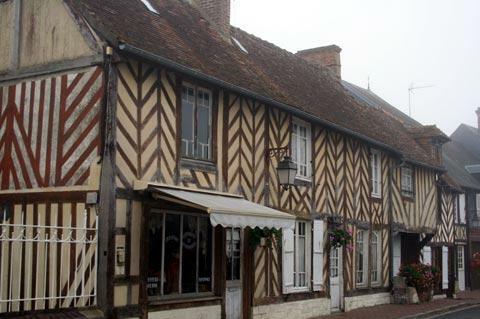 France This Way comment: Normandy has many houses, villages and towns with the same half-timbered architectural design, but Beuvron-en-Auge is one of our favourite examples. 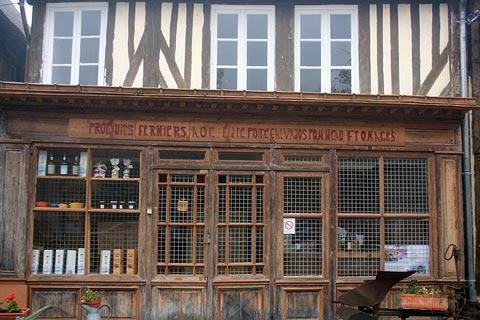 Don't forget to stop in the village long enough to have a glass of calvados after enjoying a wander around the town. In the countryside around the village you will see numerous orchards and manor houses - it is all very lovely and ideal for cycling. 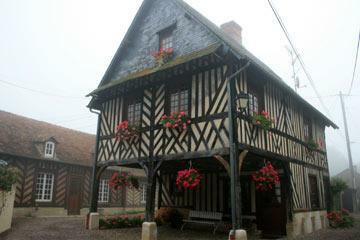 You will also certainly want to visit the nearby village of Cambremer, another traditional Normandy village. Beuvron-en-Auge is part of the 'Normandy cider route'. This cider route is a marked route that passes through several villages and passes by several cider producers in the region - you are free to sample the products! (Look out for signs marked 'Route du cidre' with a picture of an apple).